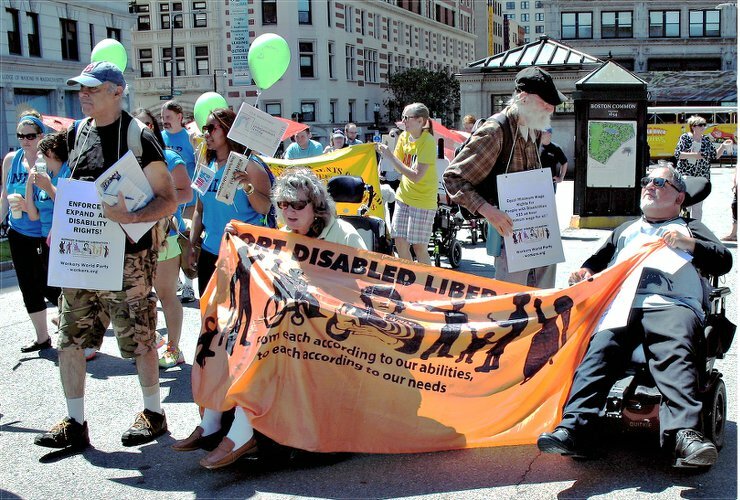 The disabled community, children, youth, and members of human service agencies and nonprofit organizations gathered in Boston on July 22 for a march and festivities to commemorate the 25th anniversary of the Americans with Disabilities Act. The event was called by Boston’s Commission for Persons with Disabilities and other state and local agencies. Drawing much attention as they rolled and marched along was a militant contingent chanting: “Disabled liberation: Yes! Discrimination: No!” and “Stop police brutality against disabled people!” The contingent was composed of members of the Stonewall Warriors, the Boston Homeless Coalition, the Women’s Fightback Network, Team Solidarity of Local 8751, and the Disability Caucus of Workers World Party. The group distributed Workers World newspaper and a Disabled Caucus of WWP statement entitled, “The disability rights movement won the ADA! Let’s fight to get it enforced, expanded and funded!” Names were collected for a future meeting on disabilities under capitalism.